Sending files via email is so last decade, and with all of the spam and malware delivered by email a lot of times it will accidently get deleted anyway. So, what email can’t do, Dropbox can! 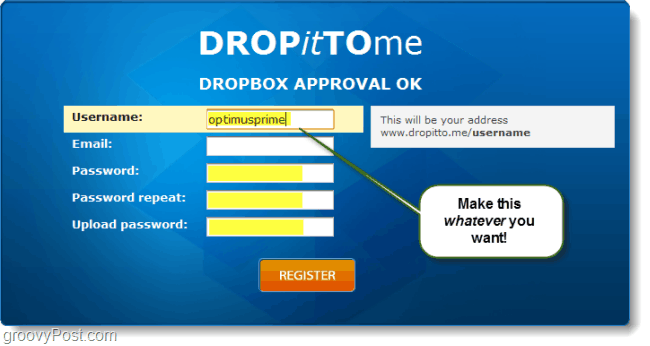 The only problem is, Dropbox doesn’t have a good way to let people send you files – that is where DropItToMe comes in. DropItToMe is a free Dropbox app that reroutes any upload smaller than 75mb straight into a folder on your Dropbox. The service offers password protection so all you really have to do is give people a URL and a password and then they can send you all the files you need. This is a simple alternative for people who might already be familiar with AirDropper. Let’s set it up! 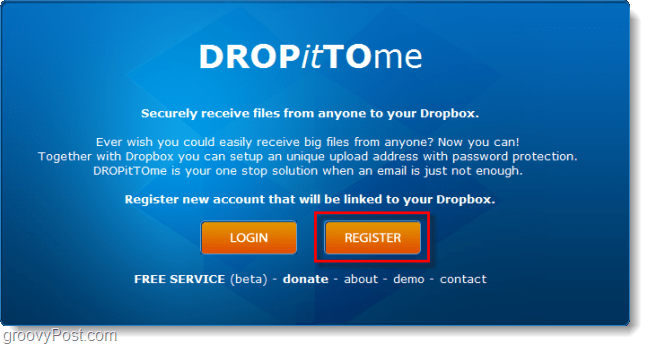 Before you get started with DropItToMe, login to your Dropbox account on the official Dropbox website. Now that you are logged in, visit http://dropitto.me. The website has a simple interface for a webapp. You can use the Login button if you already have an account, this is handy later. For now Click Register. On the next page Click the Register button again. 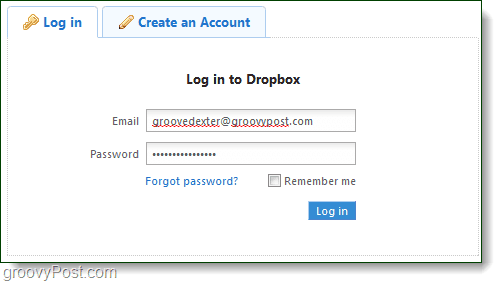 DropItToMe will now check to make sure you are logged in to your Dropbox account online. If you’re a Twitter user you’ve seen a window like this before. Dropbox will ask you if you want to allow DropItToMe to connect to your account. Click Allow. On the next page you should be redirected back to DropItToMe. Here you’ll set up your username and password. Your username is also your dropitto.me url, so choose wisely as this is what you’ll give people who want to send you files. The upload password is what people will be required to enter in order to send you said files. Once you’ve finished registering you can now give out your www.dropitto.me/ url to whoever you like and they can send you files there. When someone visits your DropItToMe URL they’ll see a window just like the one below. DropItToMe will ask them for a password and then allow them to upload any file (up to 75mb size per file) straight to your Dropbox. When someone uploads a file to your Dropbox, DropItToMe will automatically create a folder in your Dropbox called DROPitTOme and place the file there. How Do I Disable DropItToMe? There are two different ways you can disable DropItToMe. 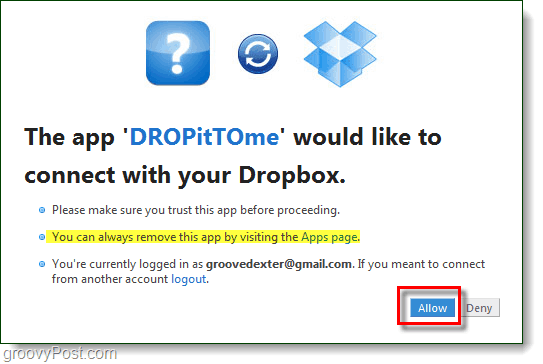 Revoke DropItToMe access to your Dropbox. For the first method, goto http://dropitto.me and login using the account you set up earlier. You’ll then be brought to a screen where you can edit the upload password, or just disable uploads entirely. The other way to completely get rid of DropitTome is to go to your Dropbox account settings and visit the My Apps tab. Here you can Click the X next to the app to uninstall it from your Dropbox account. If you need to transfer files over 75mb in size, DropItToMe is an efficient way to send files to someone’s Dropbox. The only trouble with the app is that it has to be set up ahead of time, but once you set it up it’s incredibly simple to use. I do wish that it had a receipt system so that you can confirm people received your files, but it works reliably enough that it shouldn’t be an issue. Alternatively, if you have your own webserver you can create a DropItToMe of your very own by following another groovy guide.